(340/12) 108-120 Taylor Street; St. Ann Hotel, Hotel Lennox, Bard Hotel, Notel Winfield, Hotel Warfield (1923). Stores and rooming house with seventy-three rooms and thirty-seven baths. 4B stories; brick structure; belt courses, cornice, flat arches with lintels; three-part vertical composition; Renaissance/Baroque ornamentation; vestibule: Ionic order frames entry; storefronts: arched transoms intact; alterations: storefronts, security gate, vestibule. Well-known old Tenderloin bar 21 Club here at 98 Turk Street. Original owners: Aaron and Henry M. Englander, drayage and warehouse. Architects: Ross and Burgren. 1907. Old signs and painted advertisements had a simple and engaging way of communicating. The parking sign invites one in, its lovely curved arrow pointing the way, and the Par-T-Pak ad for mixers is direct and to the point. Regrettably, the parking sign no longer exists. (339/5) 124-126 Turk Street; Hotel Portola, Marathon Hotel, Lowell Hotel, Argue Hotel, Camelot Hotel. Rooming house with fifty-seven rooms and thirty-two baths; 6B stories; faded painted sign on upper west wall for “. . . Hotel Portola . . . Rooms . . .”. Alterations: windows replaced with aluminum and all ornament and finishes except decorative iron fire escape on facade altered since 1983. Architect: Albert Farr. 1907. Another piece of vanished urban landscape is this century-old sign advertising rooms at the Hotel Portola (now the Camelot), which could be seen across a parking lot on Taylor Street between the Taylor Street Center and the Franciscan Towers. Two years after I took this picture, the Tenderloin Neighborhood Development Corporation built the eight-story Curran House on the site of the parking lot. Though no longer visible from the street, the rear wall of the Camelot and the side of the Drake Hotel now form the back of a courtyard for the Curran. (339/9) 162-166 Turk Street; El Rosa Hotel, Helen Hotel (1985). Rooming house with 30 rooms and 3 baths; 3B stories: brick structure; lobby: stair landing with blue and gold tile floor and simple moldings; painted signs on west side wall include “El Rosa Hotel . . . Transient Rooms”. Alterations: facade stripped. Original owner: O.F. von Rhein. Architect: C.A. Meussdorffer. 1906. 162-166 Turk Street; Helen Hotel. 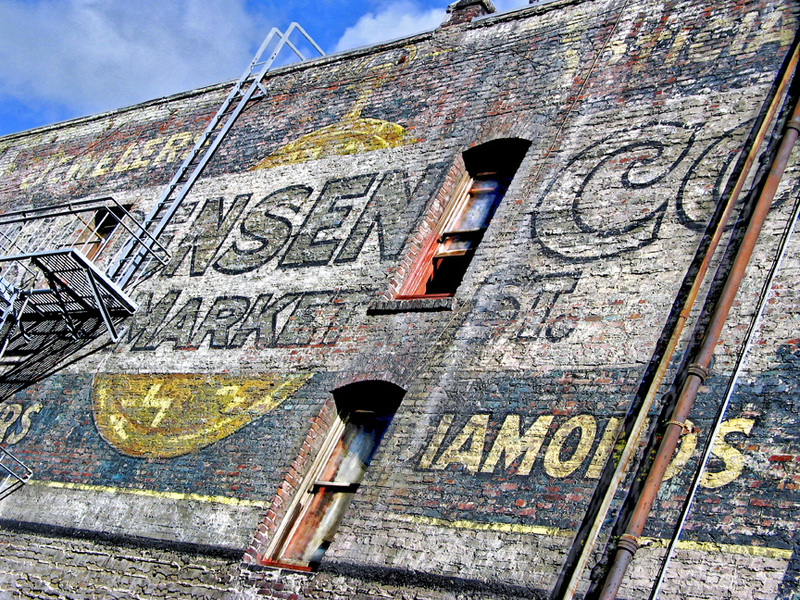 Old painted advertisements are a part of the central city landscape that I especially love, both for their visual impact and their historical significance. (318/7) 502-530 O’Farrell Street; Hotel Shawmut, Marymount Hotel (1913), Coast Hotel (2007). 1912. (693/6) 900-914 Geary Street; Hotel Toronto, Wesley Hotel, Leahi Hotel, California Hotel. Stores and rooming house with forty-one rooms and eight baths; 3B stories; brick structure; stucco facade, window moldings, galvanized iron cornice; 2-part vertical composition; Renaissance/Baroque ornamentation; storefront: prism glass transom over storefront on Larkin; signs: blade sign with neon removed on Larkin Street. Alterations: security gate, remodeled storefronts and vestibule, aluminum sash. Original owner and architect unknown. 1909. While working on the 2007 survey, I photographed another painted advertisement, one that has weathered the ravages of time quite well when you consider that it’s a hundred years old. There are many more building ads in the Tenderloin than the ones shown here, and many are covered by photographs in my other posts (refer to “building ad” tag). I recognize a lot of these pictures, but my favorite is the Zubelda sign. I lived right around the corner from it on Geary, and it’s good to see it’s lasted as long as it has (or had?). Is it still there? The Hotel Toronto, by the way, is nothing to write home about, even if you’re from Toronto . . . The “Zubelda” ghost sign is still there. The Hotel Toronto was renamed the California Hotel years ago, but it’s still nothing to write home about. Can Anyone tell me the history of 124 jones st? 124-130 Jones Street. (343/12); The Waldorf Lodgings, Romaine Hotel; stores and rooming house with twenty-two rooms and four baths. 3B stories; brick structure; brick quoins, galvanized iron cornice; two-part commercial composition; Renaissance/Baroque ornamentation. Alterations: storefronts, security gates, vestibule remodeled. Owner and designer unknown. 1908.